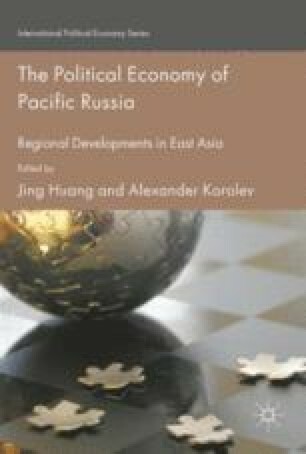 With the ‘turn to the East’ in Russian foreign policy, the development of the Russian Far East has become one of the priorities of Russian government that has made various attempts to integrate it into the economy of the Asia-Pacific region (APR). This integration should be driven by mutual interest, not only based on Russia’s vision of the prospects of its Eastern territories but also on APR countries’ demand for their involvement. This chapter argues that this demand is changing now because of the transformation of the economic model in APR countries. This transformation includes four shifts: (1) from extensive export-oriented economic growth towards an intensive one based on growing internal demand; (2) from primitive labour-intensive products towards relatively high-quality and high-tech ones; (3) from dominating exports to developed countries towards orientation to intraregional markets; (4) from rapid development in coastal areas towards fast economic growth at the former periphery. These shifts generate demand for resource-intensive (energy, land, water) consumer goods as well as infrastructure connecting new APR growth areas with territories where these goods are produced. The main opportunity of Russia’s Far East to integrate into the APR is through meeting this demand. For this purpose some approaches and principles of Russian Far Eastern policy should be revised.